The death of ex-Brecon and Radnorshire MP Lord Livsey has prompted warm tributes from his former constituents and others from across mid Wales. Lord Livsey of Talgarth, who served as MP for the rural constituency for 11 years, died aged 75. The Bishop of Swansea and Brecon the Rt Rev John Davies described the peer as a "hard-working servant of others". His successor as MP, Roger Williams, said he was "one of the nicest people any one could ever hope to meet". Bishop John said Lord Livsey was always an "enthusiastic supporter" of any initiative that aimed to sustain or improve the life of his constituency. He added: "He would readily lend his name to such initiatives. I was personally very grateful to him when, as Dean of Brecon, I invited him to become one of the vice-presidents of the Brecon Cathedral Choir Endowment Appeal which aimed not only to keep the cathedral's music alive but also to develop a love of music in the lives of choristers newly-recruited from schools in and around Brecon. "Richard did not hesitate to accept and he periodically wrote generous letters of support for what was being achieved. "Richard's kindly smile and warm disposition reflected the nature of the man. I do not hesitate to pay warm tribute to this kindly, hard-working servant of others." One of Lord Livsey's many campaigns was the fight to save Bronllys Community Hospital, near Brecon, which has been under threat for many years. The hospital's League of Friends chair, Maggie Sims, said: "He was supportive of the League of Friends and we were grateful for all the support he gave us. "He was also very supportive of the hospital, which has been under threat of closure for many years." Lord Livsey also fought for a bypass for Talgarth, his home town. William Powell, the local county councillor, said: "Richard played a crucial role in securing the A479 Talgarth relief road for his home town. "In recent years, he has been my own mentor in local regeneration projects in Talgarth and was instrumental in supporting the Big Lottery winning Talgarth Mill Project. I feel privileged to have known and worked with him and to have counted him as a friend." He added: "He cared deeply for Talgarth and Breconshire more widely. He was a quietly proud Welshman." Lord Livsey's successor as Brecon and Radnorshire MP, Roger Williams, said the peer was an excellent MP who "stood up for the needs of his constituents". He added: "His knowledge in rural issues was a huge benefit to the people of Brecon and Radnorshire and the Liberal Democrat Parliamentary Party in both the House of Commons and the House of Lords. "On a personal level, he was a huge help to me when I followed him as MP for Brecon and Radnorshire. He was one of the nicest people any one could ever hope to meet and he will be sorely missed by all he knew him." 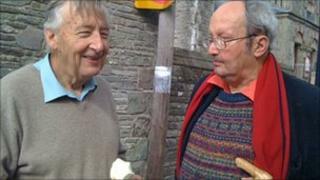 Ceredigion's Liberal Democrat MP Mark Williams said Lord Livsey's death was a "huge loss" to Welsh politics. He added: "Richard was a man of immense integrity and principle, steeped in Welsh Liberal history. He inspired a great deal of affection and loyalty and steered the Welsh Liberal Democrats through the 1980s in sometimes difficult times. "On a personal note I've lost a dear friend, who has been a great influence on my political life and will miss him enormously. "Richard Livsey will be remembered as a genuinely and thoroughly decent man who always put others before himself." The peer was also a founder of the Welsh Agricultural College in Aberystwyth and was a senior lecturer in farm management from 1971 to 1985. Prof Noel Lloyd, vice-chancellor of Aberystwyth University, said: "As a former member of staff at the Welsh Agriculture College and a Fellow of Aberystwyth University he was held in high regard by all those who knew him. "His contribution to the life of Wales and in particular to matters concerning rural communities was immense. "On a personal level he was very supportive of the establishment of the Institute of Biological, Environmental and Rural Sciences and was a good friend of the university."